I'll admit to reservations coming into this one. While the idea of a keyboard-centered band led by a Japanese woman doesn't by itself promise bad results, in my preparations I searched for videos and other materials online, and didn't find them promising. Happily, Dino Rocket Oxygen defies those expectations and is quite enjoyable. While it's true that Yuka Funakoshi and her cohorts don't present anything groundbreaking or mindblowing, they do give a prog fan a good set of music to enjoy that harkens to many of the highlights of the past without being simply derivative. The first of the CD's three suites ("Dinosaurs," "R Is for Rocket," and "Oxygen") begins with the brief atmospheric introduction called "Which Came First, the Dinosaur or the Egg?" after which we get "Dance with Dinosaurs," which has some fine work on organ, synth, and piano. I particularly like the dissonant clusters she throws in at the ends of some of the phrases, like a big dino foot smashing the keys. And guitarist Takashi Miyazawa gets in some good bits too, with some interesting distorted tones to contrast with the generous dose of keyboards. So if you're thinking the world didn't need another Ars Nova, you'll be pleased that Yuka and Chronoship is distinctly different. Funakoshi's keyboards are less aggressive and showoffy than Keiko Kumagai's, with lyrical themes and good textures, not as reminiscent of Keith Emerson. And while the vast majority of the album is instrumental, there are vocal moments, with wordless chords and melodies appearing in "Skygazer" (a tune where one of the melodies is a variation on "Twinkle Twinkle Little Star"). Lyrics first appear about halfway through, though they are electronically processed almost beyond recognition; more straightforward singing appears later, but this music is never really about the singing. I've got to say that such overt lyricism and soaring melodies would normally leave my attention wavering, but this works. The "Oxygen" suite presents a much more percussive sound, further endearing me to the band by bringing in something new, and cementing my recommendation. Fans of classic melodic progressive rock should eat this up, and even a skeptic like me can enjoy the flavors. 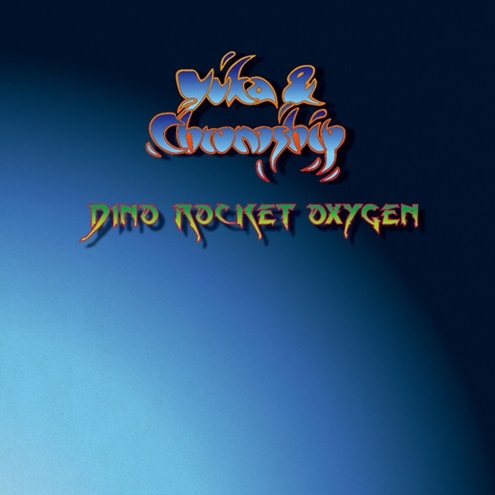 Two years after their debut release, Yuka and Chronoship are back with Dino Rocket Oxygen. There is a marked improvement in composition and musicianship. The music is more sophisticated, not dominated by the same keyboard sounds, and the guitar work is vastly superior. While Water Reincarnation was primarily a vehicle for band founder and keyboardist Yuka Funakoshi, Dino Rocket Oxygen showcases a maturing band performing as an integrated unit. Dino Rocket Oxygen is a collection of three separate suites: “Dinosaurs,” “R Is for Rocket,” and “Oxygen.” Each suite is further broken down into separate tracks, a total of 11 for the disc. The “Dinosaurs” suite is orchestral with lots of Mellotron, bubbly guitar arpeggios, organ, and synths that combine elements of 70s Italian prog and progressive jazz. The three movements segue nicely from one to the next. If you are a long time science fiction fan, you will remember that Ray Bradbury published in 1960 a collection of short stories titled R Is for Rocket. The second suite is dedicated to Ray Bradbury and it is more a collection of musical vignettes than one long piece, each exploring different styles ranging from experimental to 80s electronic music. A case in point is “Stargazer,” which could have been a standalone track. This is a poppy synth track reminiscent of Jean Michel Jarre and Mike Oldfield. And the short (1:49) “An Arrow of Glittering Music” begins with a bit of classical music on the radio in a room and then Takashi Miyazawa sounds like he is practicing his guitar in his home studio. Half way through the sound clarifies and the music becomes more sophisticated and I detect a slight Close to the Edge vibe. The third suite has three parts: “O,” “O2,” and “O3.” Overall, the “Oxygen” suite has a more percussive approach but also incorporates church organ, sweeping orchestral themes, Mellotron, and doubled guitars. Dino Rocket Oxygen is a vast improvement and demonstrates a band honing its skills.